One of my top tips for getting over a sweet tooth is to switch to fruit to satisfy a desire for sweetness. But when you’re craving a brownie (or other decadent dessert), I get it, an apple isn’t always going to cut it. Enter, fruit-sweetened desserts like these Double Dark Chocolate No-Bake Brownies. Made with almond flour, cacao and dates, and topped with a fudgy dark chocolate sauce (which firms up into a frosting if you refrigerate) this is one easy, fruit-based dessert. 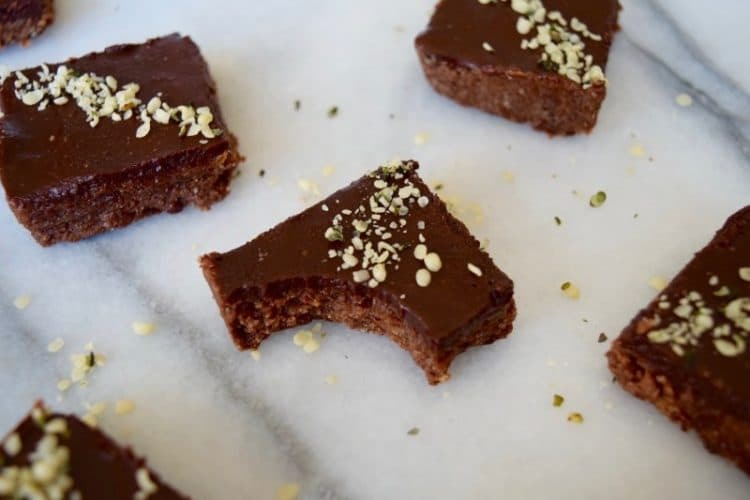 A whole food, plant-based no-bake brownie ready in 5 minutes. Make the brownie: add all no-bake brownie ingredients to a blender and blend on high until a dough like consistency is formed. Press the dough into a 6x6 inch cheesecake pan or baking dish (or hey, even a glass tupperware), to make the square shape. Remove from the pan (just push bottom up for cheesecake pan, or flip over baking dish/tupperware) and put on a plate. Make the chocolate sauce topping: In a bowl, mix together sauce ingredients until fully combined. Using a spoon or spatula, spread the sauce on top of the brownies. If you want a more frosting like consistency, refrigerate for at least an hour, to firm up the sauce. 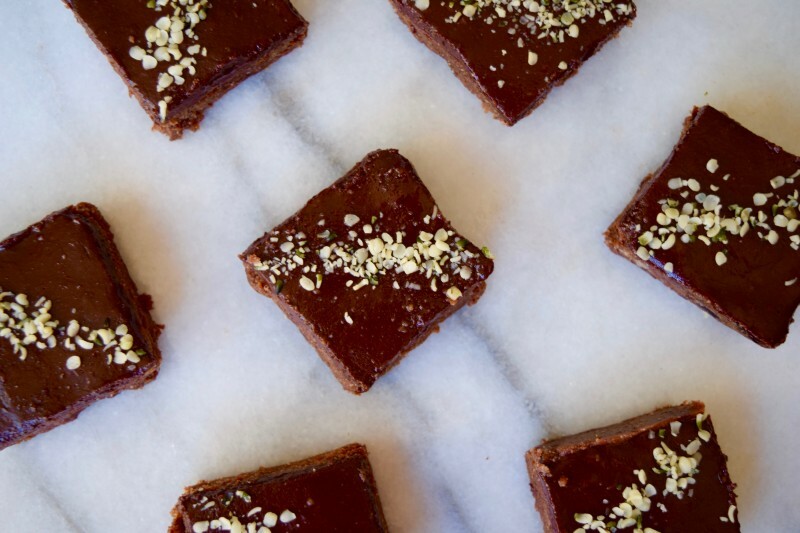 To serve, cut into squares, and sprinkle with hemp seeds, if desired. *If maple syrup was in your fridge, warm it quickly, gently on stove top or in microwave. If it is cold, it will cause the coconut oil to clump. You can skip the chocolate sauce topping, the brownies by themselves are delicious.